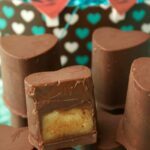 Who loves peanut butter and chocolate? Me Me Me! And most likely you too. Am I right? If so, then you’re just going to love me for this recipe (send gifts! ). 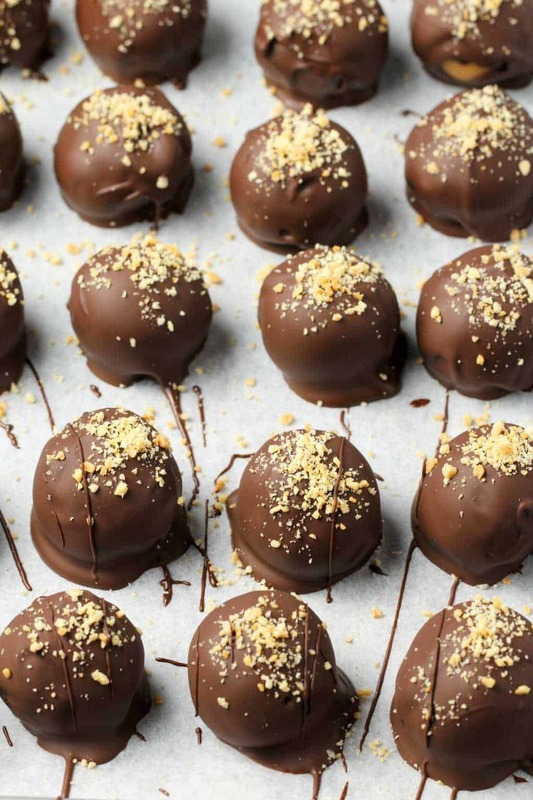 Vegan peanut butter balls are it! 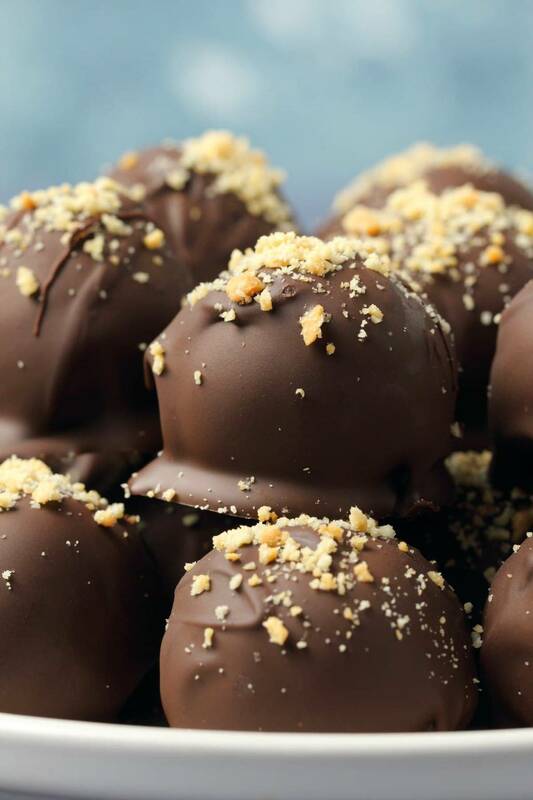 Smothered in vegan chocolate and then sprinkled with crushed peanuts, they are perfect mouthfuls of delish. For a moment I was a little bit concerned that I may be going overboard with this recipe. I mean vegan whipped cream AND peanut butter? But then I had to laugh, because really the words ‘going overboard’ and ‘confectionary’ have no relation to each other. Like what’s that? I was pretty excited at the idea of having these in the fridge for occasional snack attacks – that is of course until I noticed that Jaye was eating them at a rate of roughly 4 per hour, then I realized they were not going to be around that long! 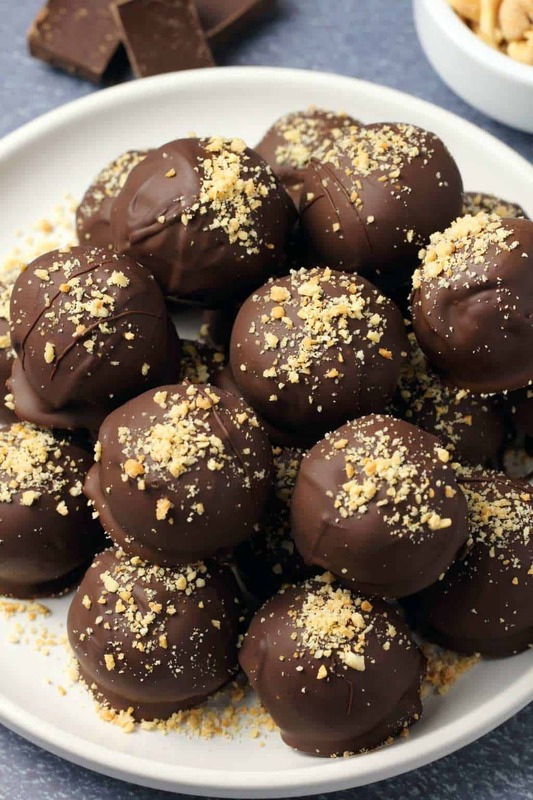 Made with peanut butter, vegan whipped cream (I used whipped coconut cream, but you can really use any vegan whipped cream) and powdered sugar, rolled into balls, frozen and then dipped in melted vegan chocolate, these vegan peanut butter balls make a fabulous sweet snack or dessert. 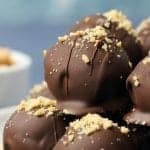 Making these vegan peanut butter balls is really easy, the only tricky part is making sure the mix is not too wet. If you make it too wet, you won’t be able to roll it into balls. So err on the side of caution here, too dry is easily fixed, too wet and it’s a flop! Well you can try and fix it by adding in heaps more powdered sugar, but you don’t want to go that route, so the trick is to add in the vegan whipped cream slowly. As soon as the peanut butter and powdered sugar goes from crumbles to mixed in (even while still very dry looking – as in our picture above), it’s likely good enough. Test a bit of the dough to see if you can roll it into a ball. If you can, you’re good to go. 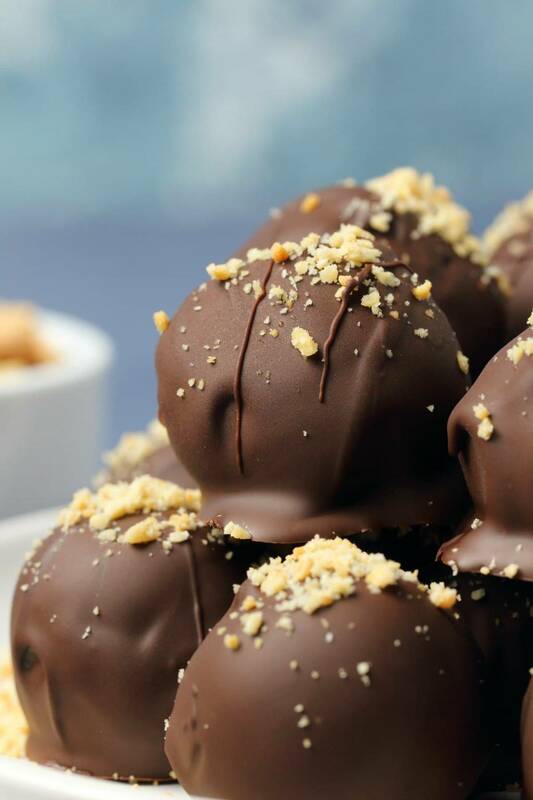 The addition of the vegan whipped cream adds a lovely extra layer of flavor to these vegan peanut butter balls even though only 1/3 cup is used. 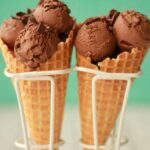 So it’s great to make these if you have some leftover vegan whipped cream going and want to use it up! 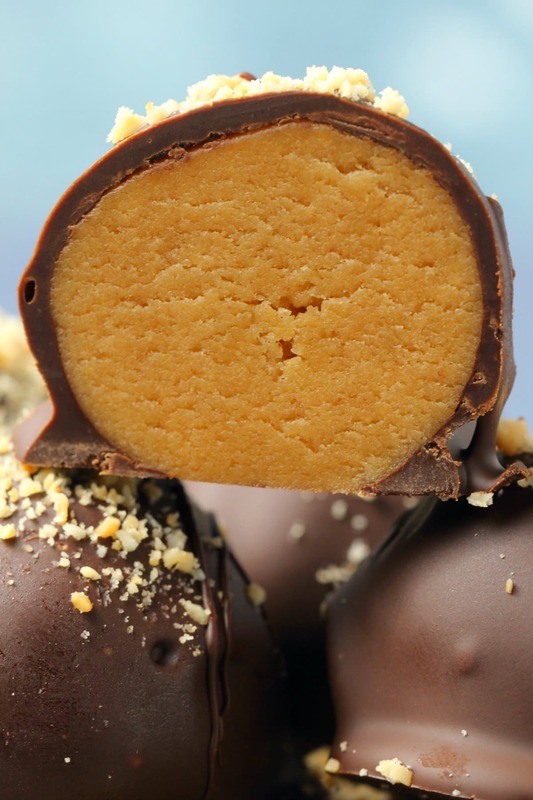 Keep them stored in the fridge and enjoy whenever you want a sweet treat! 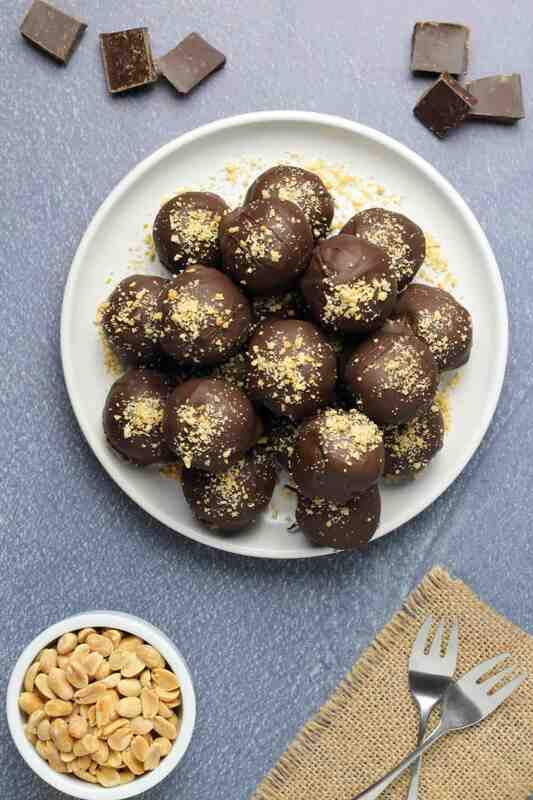 So let us know what you think of these vegan peanut butter balls in the comments and please rate the recipe too! Also, sign up to our email list, for a an awesome free recipe ebook and to stay updated with all our latest posts. 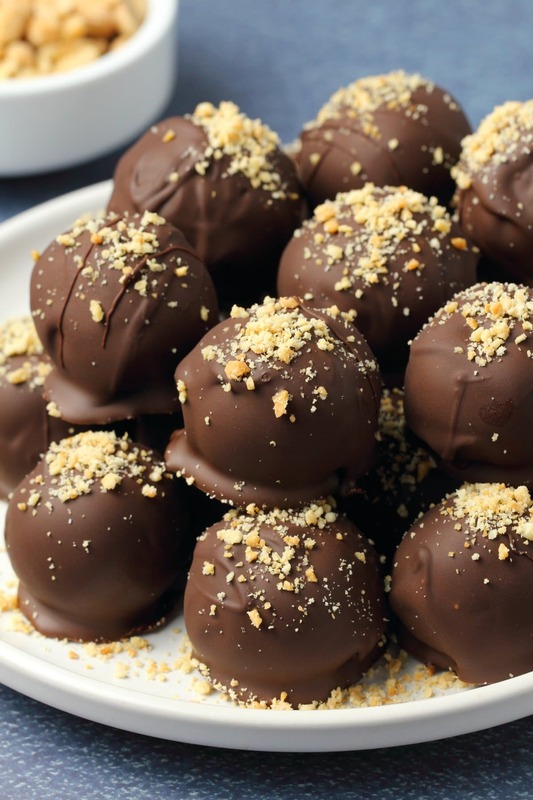 Gorgeous 5-ingredient no-bake vegan peanut butter balls smothered in vegan chocolate. Ideal as a sweet snack or dessert. Gluten-Free. 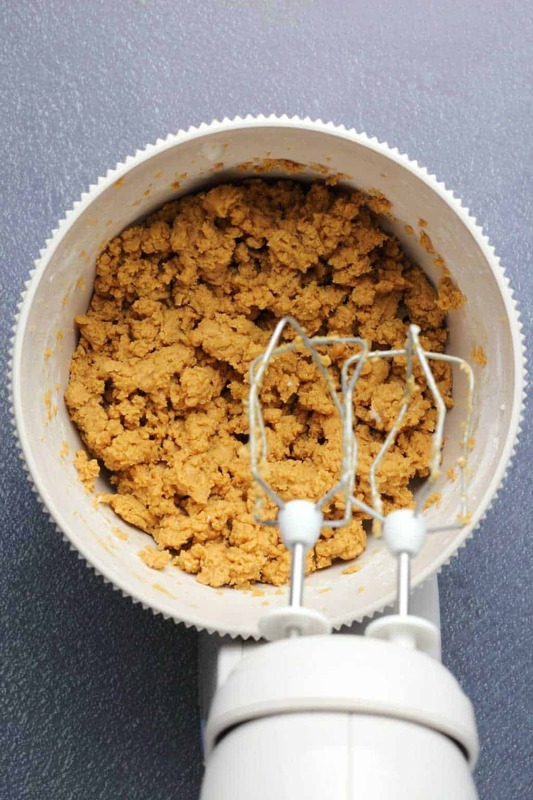 Add the peanut butter and powdered sugar to the mixing bowl and with the electric mixer on low speed mix it in. It will be crumbly. 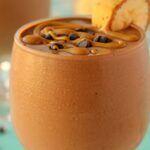 Slowly add the vegan whipped cream until you achieve a thick consistency that you can easily roll into balls. 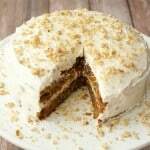 You may not need to add all your whipped cream, it depends on the kind of peanut butter you’re using, so go slow when you add in the whipped cream. 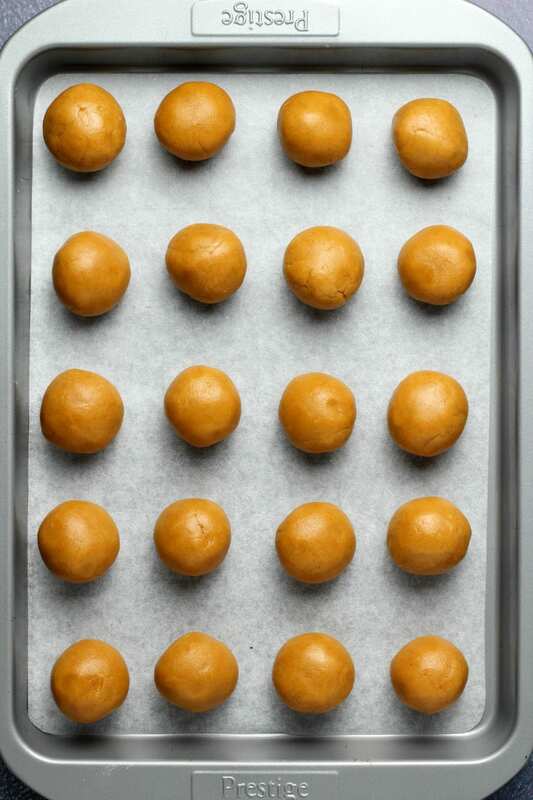 When your peanut butter mix is ready, cover a tray with parchment paper and roll the peanut butter mix into balls – aim to get 20 balls – and place the tray into the freezer for a couple of hours until the balls have set solidly. 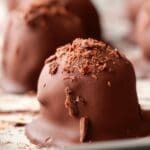 Break up the vegan chocolate and place into a microwave safe dish. Microwave in 30-second intervals, bringing it out to stir every 30-seconds until your chocolate is melted. Add in the coconut oil and stir it in (makes the chocolate a little thinner and easier to work with). 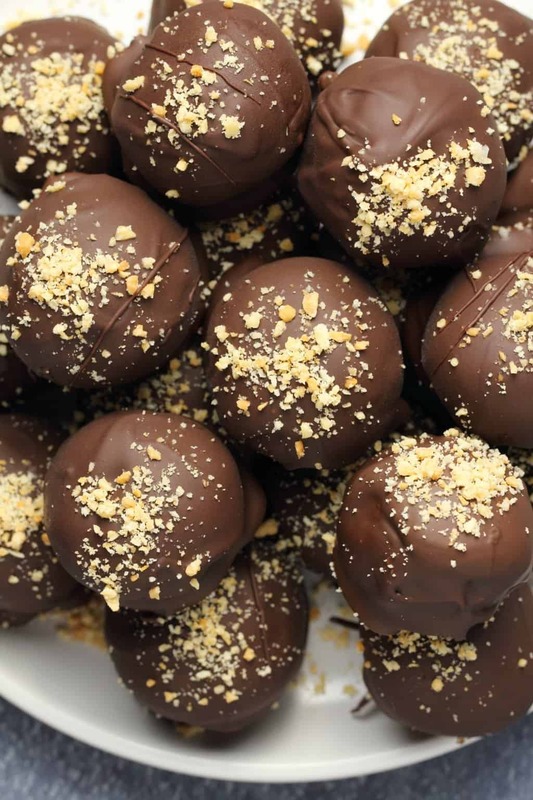 Place each ball in the melted chocolate and use two teaspoons to cover it in chocolate and then lift it out and place it back onto the parchment lined baking tray. Sprinkle with crushed peanuts (optional). 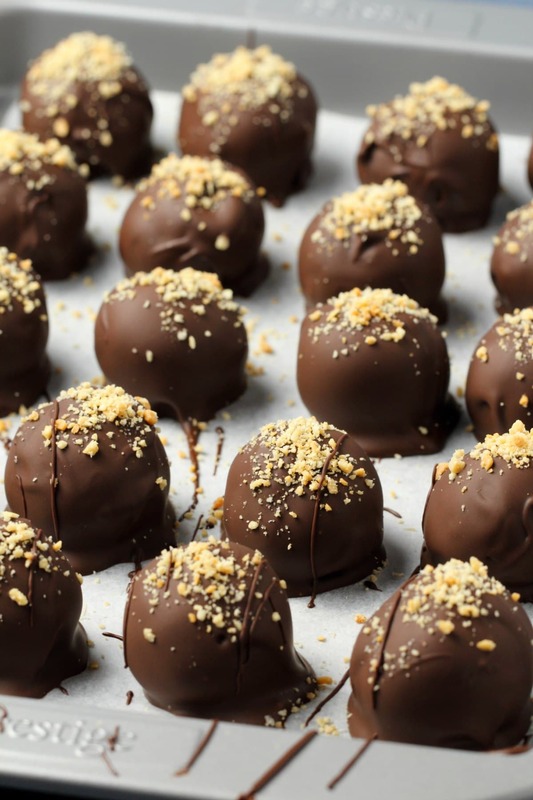 When all the balls are covered in chocolate, place in the fridge for around 10 minutes for the chocolate to set. Keep the balls stored in the fridge and serve directly from the fridge. *You can use any vegan whipped cream here, I used coconut whipped cream, but you can use any variety at all, so long as it’s whipped. *Prep time does not include time spent setting in the freezer/fridge. 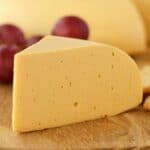 *This recipe has been updated with new photos. Im so stoked that these only have only have 4 ingredients and are healthier!!!!! Like what!?? Could you please tell me what is powered sugar? Hi Brenda. It’s a powdered version of sugar, so it’s much finer. It’s also called ‘Confectioners Sugar’. It’s used for making cake frostings and that sort of thing. You can usually find it in the sugar section of the supermarket, and it’s called Powdered Sugar but may also be called Confectioners Sugar or 10x Sugar. Just loved making these delicious chocolate balls and a super little gift for Xmas with a few wrapped in cellophane with a red ribbon. The secret to any recipe is following it strictly and it will always be a success. Thanks Anna! So glad they came out well. This sounds like an amazing idea for xmas! 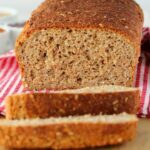 This recipe was simple to make and beyond delicious to eat. Thank you i love it! 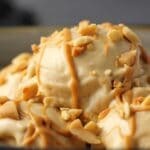 Wow, absolutely melt in your mouth peanut buttery deliciousness. Thank you so much ? Good to hear! Thanks David! 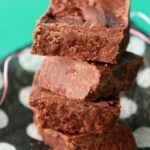 These are so delicious and easy to make, I absolutely love them! Awesome – yours sound great Deanna! Will almond butter or no-nut butter work the same as peanut butter? I’m always looking for recipes for my grandson who is allergic to peanuts, milk, and eggs. I’m planning to take a chance and try it but wondered if you had input before I do so. Hi Gayle, should be fine, the only difference may be in the relative oiliness of the nut butters you use, so just bear it in mind that you may need to use much less coconut cream if your nut butter is quite oily. 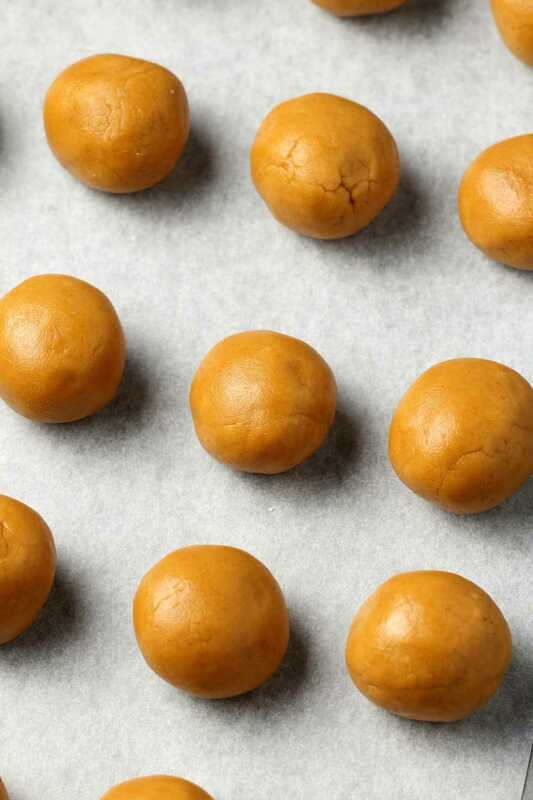 Any nut butter you use you’ll still be trying to create a texture that’ll easily roll into sticky balls. All the best! Great Recipe! I tried a version of these and they were delicious! 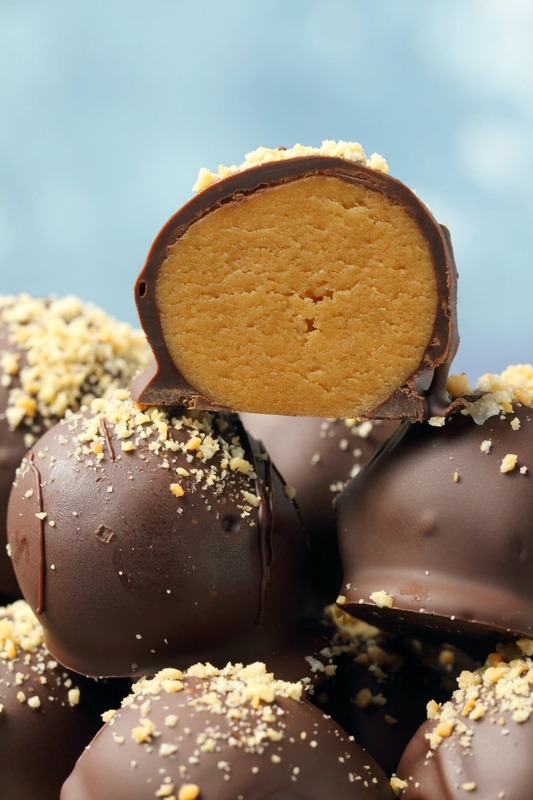 Had a bit of trouble getting the chocolate not to melt the peanut butter ball though. Any suggestions? I froze the balls, but maybe the chocolate was too hot? Or too runny? First time the consistency was to wet. During second attempt i bought some coconut flour and it fixed everything! 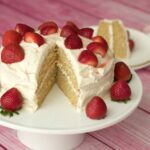 could i use So Delicious coconut whipped cream in place of making my own to cut down on prep time? AMAZING. These were so EASY to make and so much FUN!!!! !